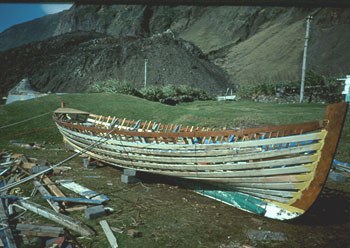 The hulls of Tristan's longboats were traditionally canvas covered frames. They were powered by both oars and sails. They are now made of fibre glass. 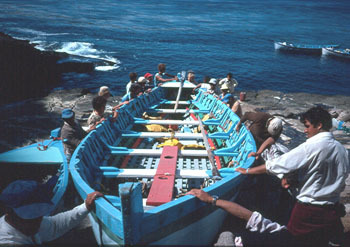 Longboat making was developed by Tristan Islanders in the late 19th Century, having previously used ready-made craft, including lifeboats donated from visiting warships. It is believed to be Gaetano Lavarello, shipwrecked on Tristan in 1892 after his ship Italia was on fire in the ocean, who first developed the vessel, based on the appearance and shape of 'whaleboats' used in naval service. First mention of the craft was recorded by Captain Elliot, commander of HMS Beagle in November 1901. The catalyst for the development of longboats was the need for craft to visit the neighbouring islands of Inaccessible and Nightingale on foraging trips for the meat and eggs of sea birds, including albatross and great shearwater, and later for penguin guano as fertiliser. This was necessary following over-hunting and rat infestation on Tristan da Cunha island. The design of longboats evolved over the years, but from the start longboat making was a co-operative venture between a group of 6 or 7 men who shared in gleaning materials, became co-owners and would always refer to the vessel as 'my boat'. This team work would re-enforce family ties and often replicate similar joint projects when building or extending houses and later in creating teams to compete against one another on 'Ratting Day'. Indeed there was friendly rivalry and pride in trying always to have the best (and fastest) longboat. 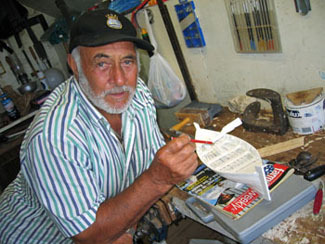 Longboat names were often inspired by ships. So the names Canton, Morning Star and Daisy commemorated whalers from New Bedford in New England. Morning Star was the last square-rigged American whaler to visit Tristan in November 1913. The boats grew in size, reaching 24ft and six oars with Gaetano Lavarello's Wild Rose by 1908. So Wild Rose gained the name Longboat henceforth. By the time of Gaetano's death in 1952, Longboat was 30ft long. Bob Glass introduced a more patriotic name when he and his sons named their vessel British Trader after a British exhibition ship, scheduled to call at Tristan during a world tour in 1922, but not turning up! Asturias was named after the cruise ship of that name which called in 1927. Henry Green and his team re-named Daisy Carlisle following visits by HMS Carlisle in the 1930s, but in the Tristan vernacular it became known as the Carline instead. Later other British inspired names were used, including British Lion, British Flag, and, after the 1957 visit of HRH Prince Philip Duke of Edinburgh in 1957 about the Royal Yacht a boat was named Britannia, but promptly shortened to Tanny! The Morning Star's canvas shell was ripped open and abandoned at sea en route to Nightingale. Men and gear were saved by other boats. Its replacement was named Lorna at the suggestion of a priest who provided much of the wood. On return to Tristan in 1963 a longboat was named Stirling Castle in honour of the role this Union Castle liner played in transporting the evacuated Islanders from Cape Town to Southampton in October 1961, and transport the advance repatriation party from Southampton to Cape Town in August 1962. Originally longboat frames were made from driftwood, covered with stretched canvas or old mailbags, made waterproof with oil and paint. Later imported wood was used, sections which needed to be bent into a bow-shape were weighted down and submerged in the Big Watron stream to make them more pliable. The light weight was essential to land on Inaccessible and Tristan's boulder beaches, and on the steep rocky foreshore of Nightingale Island. Little Beach, immediately below the Settlement served as the local launch point, with boats hauled up below the cliffs behind. After the 1961 volcanic eruption longboats were drawn up into the village to keep them away from high seas, now tethered by ropes and metal stakes between The Residency and St Mary's School. 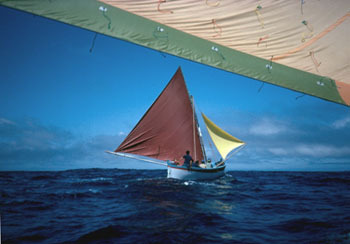 Canvas sails were replaced by replaced by nylon in the 1990s, and recently longboats are seldom used as Islanders use inflatable RIBs and dinghies are carried by fishing boats on trips to Nightingale and Inaccessible. Now that Inaccessible has been declared a World Heritage Site, it is only Nightingale Island where limited sea birds and their eggs are harvested. See Nightingale Island page and the Wildlife and Conservation sections for details. Coxswains: Edwin (Spike) Glass, Stan Swain and Tim Green Crew: Mark Swain, Raymond Green and Graham Rogers. Above : scenes in the early 1980s showing the shell of a Tristan longboat during a winter re-fit of damaged wood and a longboat proudly hauled up on to the safety of Nightingale's landing rock during a new year guano trip.